Disorder, Disruptions, Directions: A New Era in Global Diplomacy? 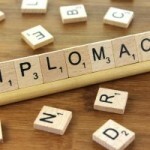 The Oxford English Dictionary defines diplomacy as ‘the management of international relations by negotiation; the method by which these relations are adjusted and managed by ambassadors and envoys’. On the eve of International Women’s Day, please join us for a special panel featuring the Ambassadors of Germany and France as well as the High Commissioners from the United Kingdom, Rwanda and Australia as they discuss the challenges and opportunities of their expanding range of functions in the context of the larger global challenges of reducing intractable problems that threaten world security and stability. This panel forms part of a two day celebration of CIPS’s 10th Anniversary. This event is open to the public and will be first come first served for seating. Please note that CPAC will be filming this event.